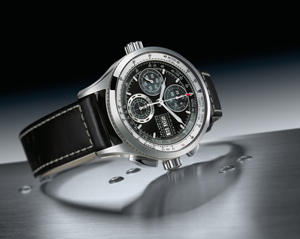 Watch company Hamilton has recently introduced its novelty years – watch Hamilton Khaki X-Patrol, which is a highly complex chronograph, created on the basis of a new caliber of H21, and provides high accuracy and increased cruising range. Watches are equipped with a turning bezel, responsible for the translation unit: height – from feet to meters, a distance – from miles to kilometers, the amount of – of gallons to liters, weight – from pounds to kilograms and vice versa. As the representatives of the company to carry out the transformation is easy: first of all, you should unscrew the crown to position “9” hours, and set the arrow to the desired unit of measurement on the outer scale bezel, then the corresponding equivalence can be seen on the inner scale. Following the settlement operations crown should be put into place and tighten until the next use. Clock face is decorated in the best traditions of the chronograph. Thus, three chronograph counters are concentrated in the left side of the dial, allowing you to display hours, minutes, seconds, and are operated by buttons on the side of the body in position “2” and “4”. Aperture indexing day and date is a central element of the right side of the dial. Cruising news – 60 hours. Well, I think some of you have clearance Khaki X-Patrol seems balanced and dynamic, while those who prefer the simplicity and clarity of the lines – a novelty just a few seem overloaded with details. You can buy watches from authorized representatives of Hamilton.